To make FULL SCREEN click on the symbol in the lower right hand corner of the video window. All shows are archived here right after the broadcast. Stop the Wars and Restore Our Civil Liberties. CLICK HERE to Keep Kevin on the Air and to Support False Flag Weekly News Help me keep doing False Flag Weekly News! I’m Kevin Barrett, co-host of False Flag Weekly News (FFWN) and I can no longer afford to keep doing this show for free. So we are going to have a separate fundraiser for each weekly episode. If we raise at least $200 by Friday, April 12th I will do that day’s show. Anything over $200 per week will be donated to No Lies Radio/No Lies Foundation and Khidria, Inc., both 9/11-truth supporting registered 501(c)3 nonprofits. Is False Flag Weekly News (FFWN) the world’s best news show? Many people think so. Hosted by Ph.D.s (and sometimes featuring other expert guests) with expertise in history, global affairs, humanities, and other issues related to the phony “war on terror” among other scams, frauds, and deceptions, we cover the context behind the headlines to help you understand what’s really going on. Unlike mainstream and pseudo-alternative media, we don’t accept advertising. That’s why we’re free to “tell it like it is”! 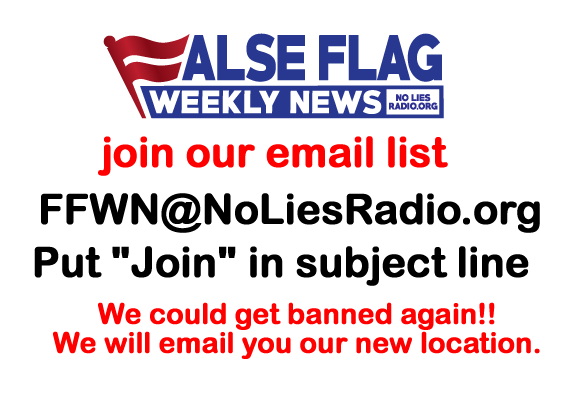 So please support False Flag Weekly News! You can catch us every Friday at 11am Eastern on http://NoLiesRadio.org – or watch the archived shows at https://noliesradio.org/archives/category/archived-shows/false-flag-weekly-news. Will Turkey Anchor New Islamic Axis of Resistance? 33) A mom refused to take her unvaccinated toddler to the hospital for a fever. Armed police officers tore down the door. 34) “Head of Ukraine’s Jewish Community” wins first round—his “primary ambition” is to “drastically expand” Holocaust indoctrination—obviously the top priority of Ukrainians! 35) Everybody must get (Holocaust) stoned! But….only 70k?! I smell denial! This entry was posted on Thursday, April 4th, 2019 at 6:11 pm	and is filed under 9/11, Education, False Flag Weekly News, False Flag/Fake Terror, Freedom, Geopolitics, Human Rights, Israeli spying and influence, Kevin Barrett, Mass Shootings, News, Protest. You can follow any responses to this entry through the RSS 2.0 feed. WHY are you requiring my email address to unlock the video? This is not open-source media. You ‘promise’ you won’t share my email with anyone(like we’ve never heard that one before), do you also promise not to get hacked?? You complain frequently about your hosts having their PCs tampered with/hacked, missing files, YT streaming being edited in real-time -but absurdly making the claim to ‘not give/sell my email address’! Make it available to everyone – less the price of email address admission – or stop claiming to be supporters of freedom. While I do disagree with myriad stances espoused on FFWN, I utterly oppose censorship; so, keep on keeping on, and good luck.